Today was a Sunday different from the past Sundays that I had. Someone told me that I looked like a gigolo. Some background to that: As usual, I went to attend a religious service Sunday morning. Since some friends of my friends were visiting, which apparently, they haven't seen for a long time, there circulated some invitations to eat out, and they also invited me. Which I accepted. Some elaboration to the background: People who attend the service always wear a suit and tie. Which I also do. But then, since the meeting is over, I decided to remove my tie and unbutton my shirt, but I still had the suit on, since it was cold, although not freezing. The other men didn't remove their ties, but this didn't mean that I committed a faux pas. But then, a friend of mine jokingly said that I had the "Hello Look." Some background on the "Hello Look": This friend of mine is married. And one night a month ago, I just greeted his wife "Hello." Not the regularly intonation-less "Hello" but the horror-movie type vampirish "Hello." But the wife laughed when I greeted her that way, and she said that I sounded like I was about to pick up girls when I say that greeting in that tone. But of course, she was just joking, as she definitely could see that my facial expression and the intonation didn't match. So I guess what a vampirish "Hello" to me can be a gigoloish "Hello" to others. So, when my friend told me today that I had the "Hello Look", he meant that I looked like a gigolo. Of course, why would I get offended? It's just that I am surprised myself, to have that effect on others. Now, I could attest to what the psychologists have been saying that the more beautiful a person is, the more advantages he or she could get in this world. Wrong, I know, it is not poitically correct, but sadly, that is human nature. People look into beauty more than what people claim to think. Now how does this relate to my "Hello Look"? It is not that I am obsessive with my weight, but I have to admit, I feel comfortable now than say a year ago, when I wasn't doing anything to keep my weight on check. I had a protruding belly, I was overweight (but not obese), and it just didn't feel good. It wasn't an enticing thought to show one's body in public. Now, whenever I glance at the mirror, I see myself sideways, and I am amazed at how that belly shrank in size. I have to admit, I feel more confident with my body right now, than a year ago. So I am taking that comment on be looking like a gigolo as a compliment. 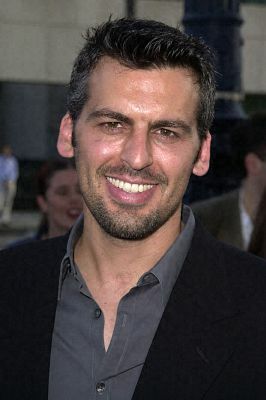 By the way, the "Hello Look" is similar to what Oded Fehr has on the picture above. An open shirt beneath a suit. Hehe, how vain of me to blog about this. So don't worry, dress yourself as you like it!